If you are in need of work boots then chances are you are going to be on your feet all day in your workplace. This means that this type of footwear has got to be totally comfortable and practical. It can be kind of hard to determine this just by trying them on for a mere few minutes prior to purchasing them. These few tips will help you make the most of your assessment of the work boots you are thinking about buying. Depending on your work conditions you may wear a certain type of sock. If the weather is cold you may tend to wear heavy work socks. If your feet tend to sweat, then you may opt for lighter socks. No matter which these are, make sure you are wearing them when you go to try on a new pair of work boots. It is a common habit when people are trying on boots or shoes to just try one on. If it seems to feel okay then they will go ahead with the purchase. One of your feet may be slightly different and you want to be sure that both boots are going to give you the level of comfort that you need. You won’t have the opportunity to wear the boots outside of the store while you are considering buying them. But, you do have the opportunity to lace them up if required and walk around the store with them on. Go through some of the motions that you would be subjected to in the workplace, like kneeling and bending. Focus on the boots to see if they are working well with your movements. Try simple walking in them, plus moving your toes up and down and rolling your ankle. These are all movements that you will be making during the average wearing of the boots. 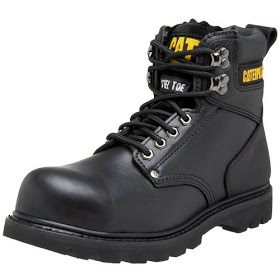 Don’t forget to also inquire about the hardness and toughness of the work boot.